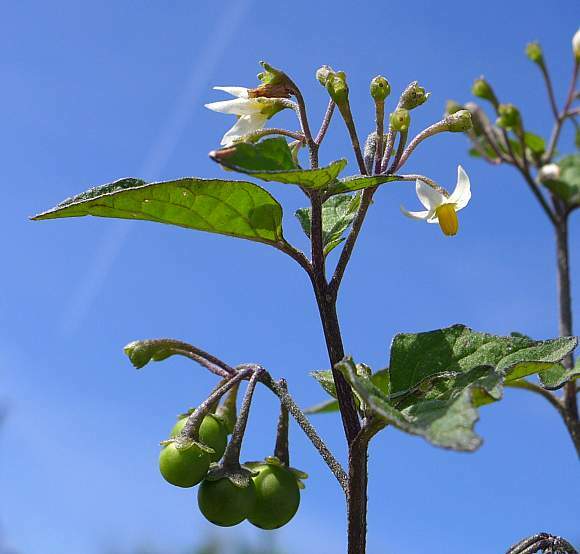 The glycoalkaloid poisons α-solanine and α-chaconine are to be found in the nightshade family of plants, the (Solanaceae), in particular in potatoes (Solanum tuberosum), tomatoes (Solanum lycopersicum or Lycopersicon esculentum), egg plant (aubergines) (Solanum melongena), Sweet and hot peppers (Capsicum species) Thorn-Apple (Datura stramonium), Apple-of-Peru (Nicandra physalodes), Black Nightshade (Solanum nigrum) and Bittersweet (Solanum dulcamara). It is present in small quantities throughout potato tubers, especially in the sprouting shoots, but a lot more is synthesized by the potato if the tuber is exposed to sunlight, where the exposed parts become green (with harmless chlorophyll). It is in and near the green parts where the highest concentration of solanine is to be found. 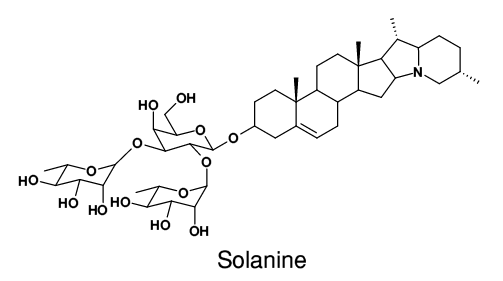 Solanine is not rendered safe by boiling, but deep frying at 170 Celsius does destroy most of the solanine. Normally, potatoes contain between 20mg and 150mg per kilogram of raw potato, but when turned green by exposure to sunlight may contain as much as 1000mg/kg, mostly just under the skin (the shoots contain even higher amounts). 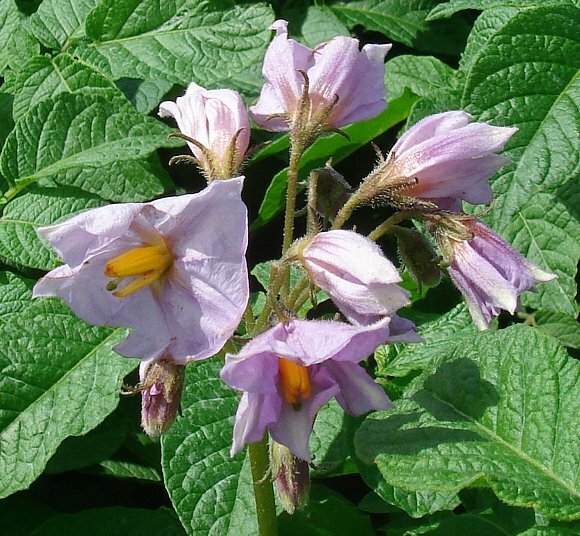 Solanine adds an un-pleasant bitterness to the flavour of potatoes when its concentration exceeds 200mg/kg, so potato poisoning is now rare, especially as cooks are now more aware of the dangers of greening or sprouting potatoes. The above two Solanidanes (which have fused indolizidine rings [top-right]). The two differ only in the sugar moieties attached at the 3- position of the steroid molecule. 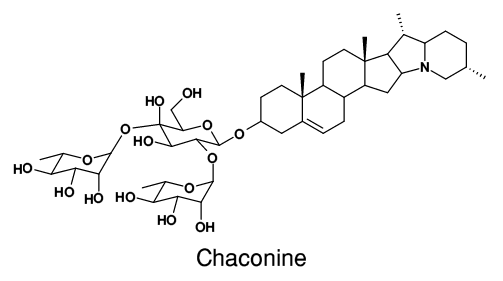 Whereas the Tomatine below is a Spirosolane, which has instead of a fused indolizidine ring an oxa-azaspirodecane alkaloid portion [again, top-right] attached to a single carbon atom of the steroid. 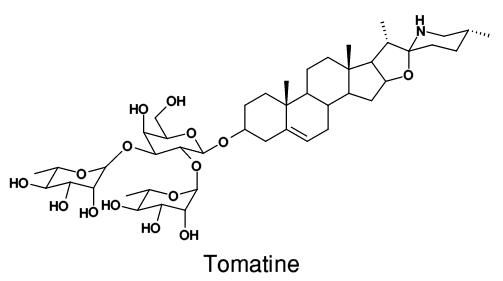 Tomatine has the same sugar moiety attached to the 3-position of the steroid as does Solanine. 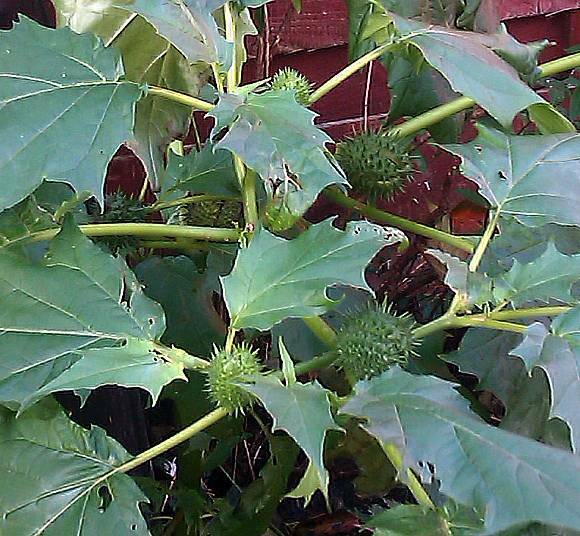 Solanine has, amongst many other effects, a choline esterase inhibitor function and thus affects the central nervous system. 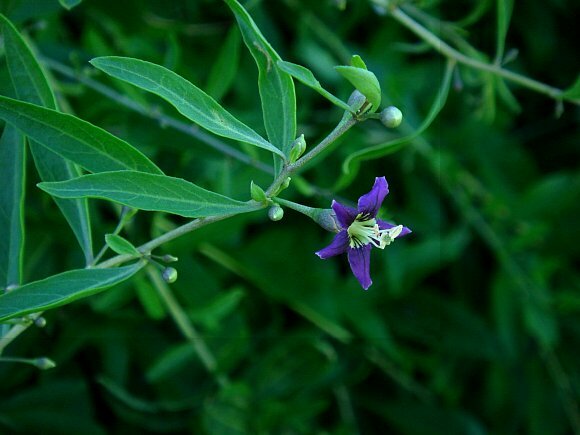 The symptoms of solanine poisoning are nausea, vomiting, diarrhoea, stomach cramps, burning of the throat, heart arrhythmia, dizziness, and in severe cases hallucinations, loss of feeling, paralysis, jaundice, hypothermia and death. It causes apoptosis in cells; the cells commit suicide. Between 2 and 5mg/kg of body weight will cause severe poisoning, possibly fatal. 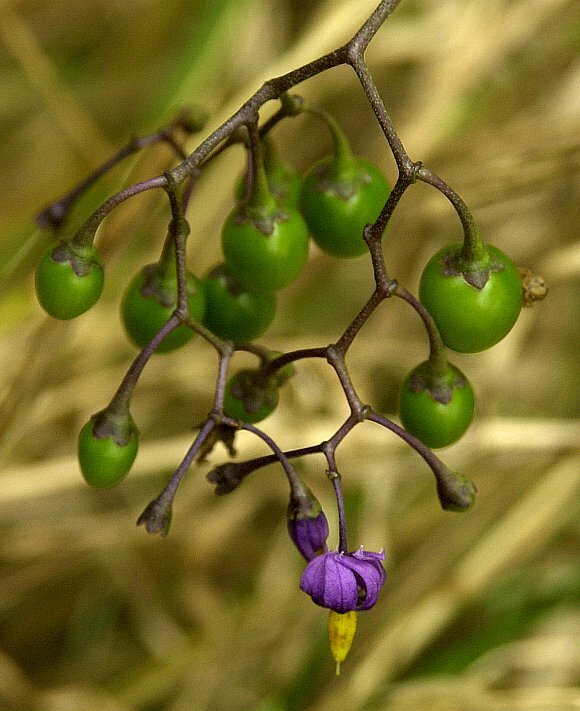 Tomatine is another poisonous glycoalkaloid. 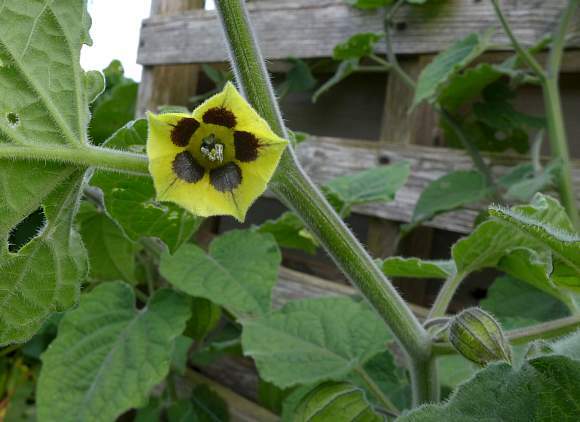 It is found in green tomatoes, hence the name, and has a fourth ring upper right, as well as other differences. 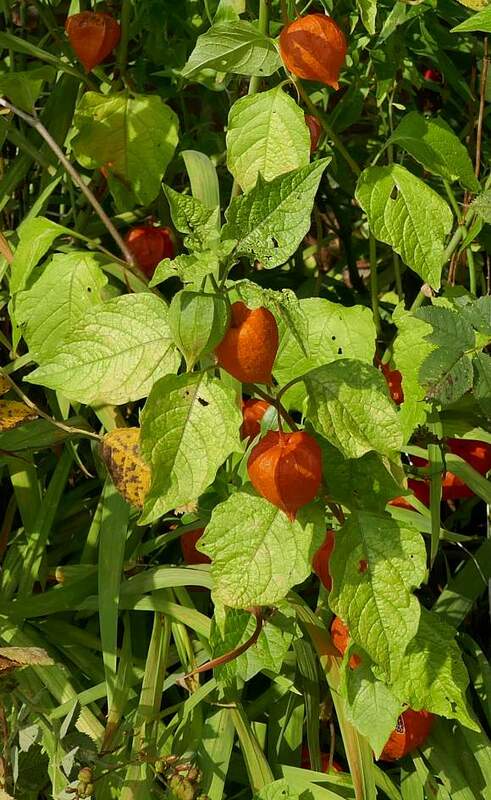 α-tomatine in tomatoes acts as an anti-fungal, anti-bacterial and against insects and has been shown to display interesting pharmacological properties against bacteria, virii, fungi and tumours.